Tennis is fun, and even more fun when you get better. The experienced, positive and passionate coaches at the Tennis Heaton camps will help you become a better, more inspired tennis player, whatever level you play at. You’ll have the best time as you gain new skills and make new friends. Tennis Camps are suitable for boys and girls from 4-16 years and we have a camp just for you! Booking a place at one of our camps is really easy. If you are already a member at Heaton then you pay the member’s rate, which is £50, otherwise just click on the non- members link to book and pay for £55. Because Tennis is Serious Fun! We love tennis and believe that tennis is a sport for life that can be enjoyed by the whole family. Players of all ages and skill levels can improve their games whilst having a great time in the process. 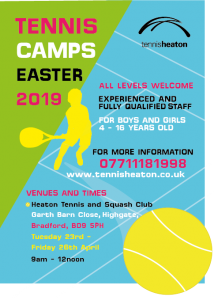 Tennis Heaton Camps are directed by some of Yorkshire’s most respected coaches and tennis professionals. They have a passion for teaching, take enormous pride in the quality of their camps and personally hire and train their camp staff. 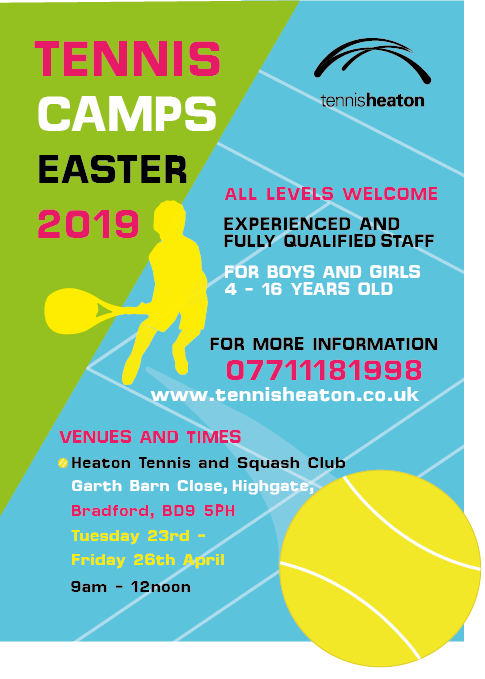 Tennis Heaton Camps are suitable for boys and girls aged 4-16 years. A wet weather programme operates in the event of bad weather the indoor tennis courts will be used where children participate in fun team games and multisports. Please wear comfortable sports clothing and non marking shoes. If you do not have your own racket one will be provided on the day. Please bring a snack and a drink as breaks will be taken throughout each day.